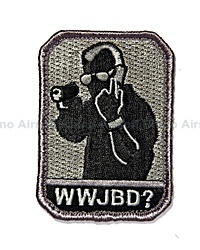 What Would Jack Bauer Do? A patch for the tv show "24" fans. Jack Bauer is a man of results, so sometimes you need to ask yourself....now what would he do? velcro sewn on the back.